For Nov, Rosanna had us do a big Single Girl block. I’ve owned this pattern since Denyse published it, but as soon as I opened it up, I knew I would never make it. Denyse uses templates in a lot of her patterns where I don’t feel like templates are so necessary. Look at me – questioning the methods of Denyse Schmidt! But really, I love her quilts so much, I’m just too lazy to put the effort into them that the patterns call for. I guess that’s why they sell for so much money! So anywhoo…Rosanna cut ALL THE PIECES! She sent us these nice little packages of all the little shapes that make one ring. I can’t imagine the time she spent preparing those packages. All I know is that I got to do the fairly simple sewing on this awesome block without doing any of the mundane or tedious pattern tracing and cutting. So thanks, Rosanna! Taking this pattern out for a spin showed me that it’s not the big, awful pain I thought it would be. 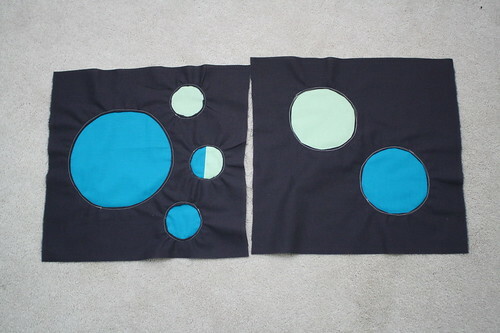 And if I cut multiple pieces (stacked fabric, cut four or five at a time), I could almost see making a quilt with it. 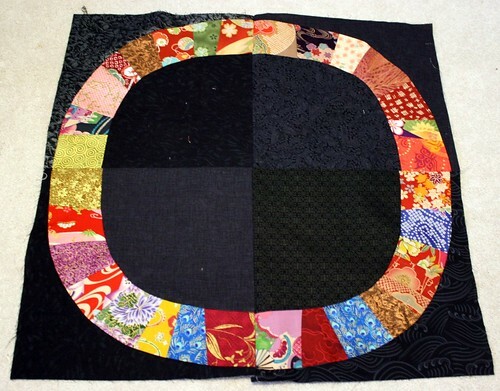 The finished block was huge, so six would make a great baby quilt. And then for Nov., Natalie wanted porthole blocks. This was a fun new technique for me. Although, I never could get my seams as smooth as I wanted. We used Ric Rac’s tutorial – which is super easy. I’m sure I’ll use this technique again – and really, you could do any shape. In other sewing news, I finished up the Here We Go bag for my aunt Jamie. 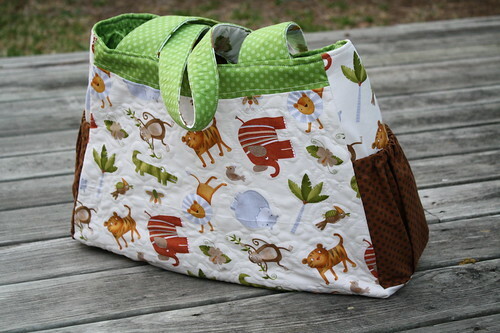 Using the pattern in Anna Maria Horner’s book Handmade Beginnings – Jamie picked her own fabrics, and I put together this GIANT diaper bag. Pretty easy pattern, and the technique used for closing up the top and sewing the inside and outside together was suprisingly easy. I normally make bags using the ‘birthing’ method – where you flip the whole bag right-side-out through a small hole in the bottom. 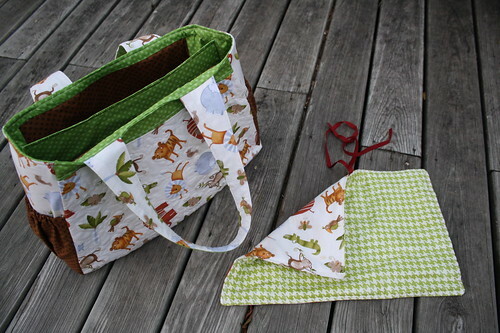 This bag uses a bias strip sewn around the whole top like quilt binding. I ended up hand-stitching it down, just like I would do a quilt. Not bad at all. 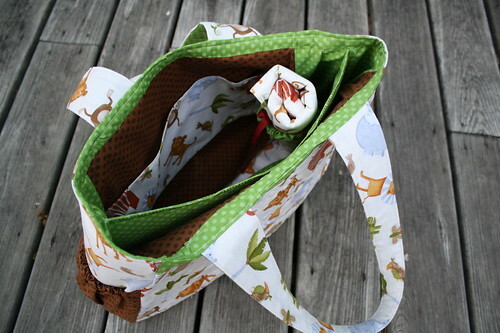 The bag has a center divider with pockets on both sides and pockets around the inside lining. There’s also a little elastic loop that holds the changing pad. And I found a great laminated herringbone fabric on fabric.com – perfect for the changing pad. Although, I really need to get one of those slippery feet for sewing on vinyl and stuff…what a pain in the neck! It is so cute… I love the animals!